A Pale Shadow of its Past Glory? 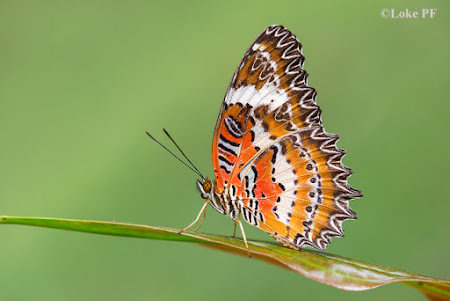 Back in the 1980's, whenever someone mentions 'Butterfly Park (or Farm)', one would usually be pointed to the Penang Butterfly Farm at Teluk Bahang, Malaysia or the Sentosa Butterfly Park in Singapore. The original Penang Butterfly Farm, the "first tropical butterfly exhibition in the world" was opened in March 1986 by its founder/owner, David Goh. The Butterfly Park at Sentosa followed in Jun 1987. Both attractions were designed by Irish landscape designer, Gordon Ledbetter, who was also involved in butterfly farms in Stratford-Upon-Avon in England and Edinburgh in Scotland in the mid-80s. 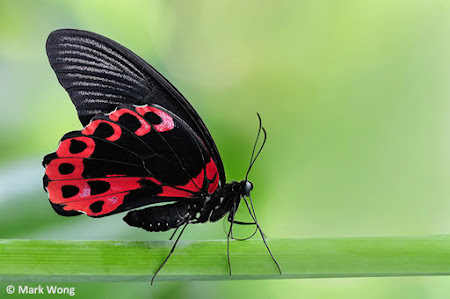 Over the years, I had the pleasure of visiting the Sentosa Butterfly Park quite regularly (as I often do too, for the Penang Butterfly Farm whenever I visited Penang). 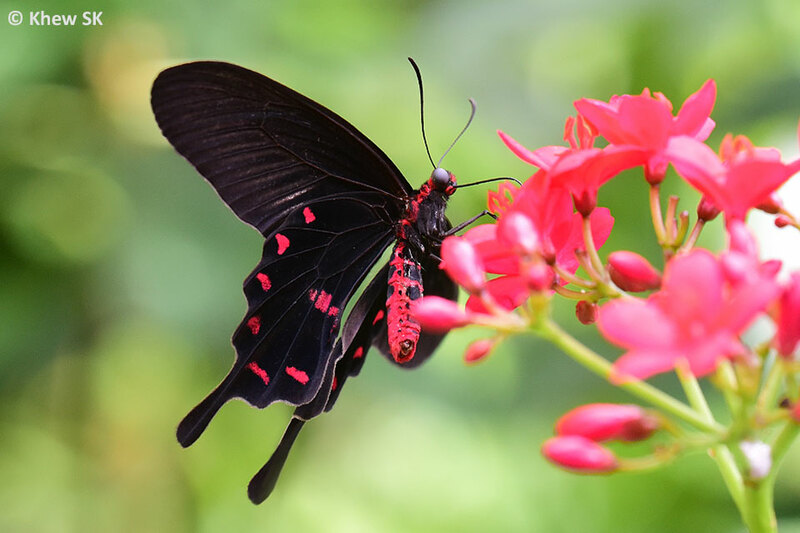 Whilst the Penang Butterfly Farm featured almost exclusively Malaysian butterfly species, the one at Sentosa featured more exotic species like the spectacular Ornithoptera butterflies from Sulawesi, and other non-native species. 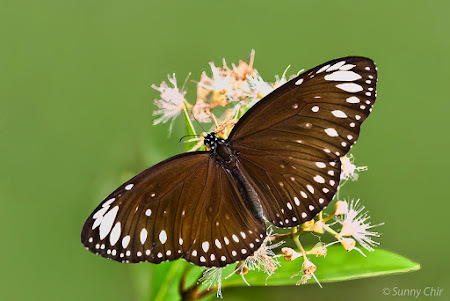 It was always an enjoyable experience to visit both butterfly parks and to be surprised by species that I had not encountered before in the wild. 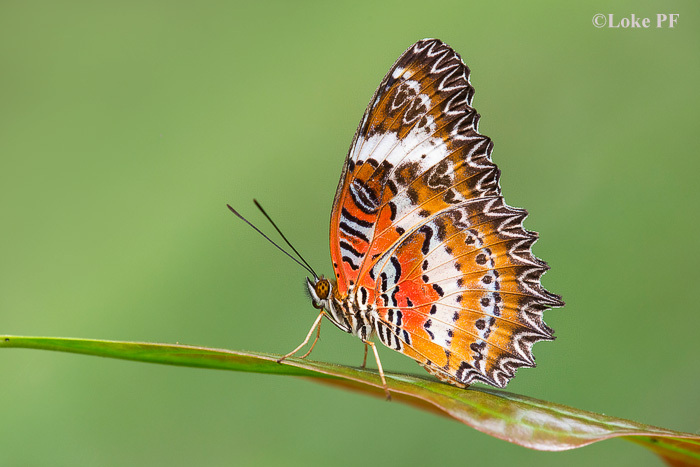 In July last year, the Penang Butterfly Farm transformed itself with a major revamp of its premises that quadrupled its original size. Its rebranding to Entopia and leveraging on technology and education, gave it a much-needed boost in visitorship, and the new premises is probably the largest butterfly aviary in the region today. 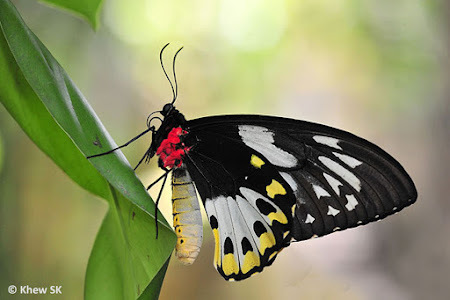 I had last visited the Sentosa Butterfly Park (named Sentosa Butterfly Park and Insect Kingdom in full) some time in 2013. 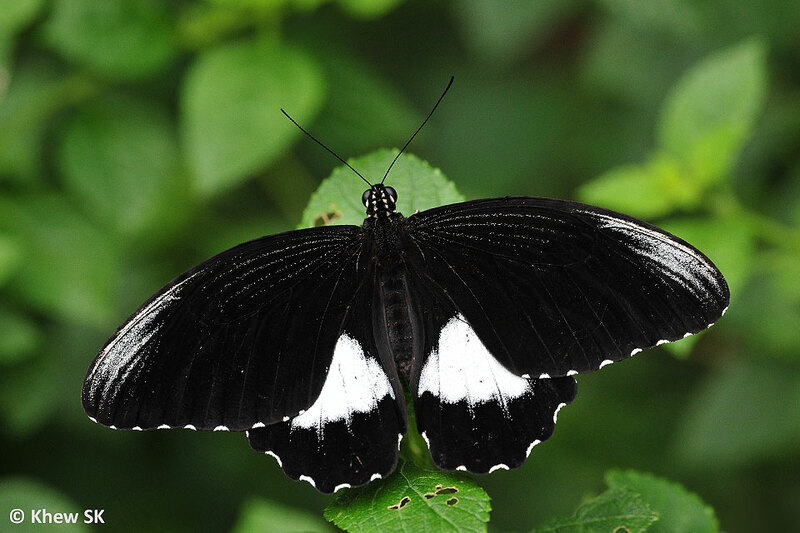 On that visit, I could still see some interesting Indonesian species like the Scarlet Mormon (Papilio rumanzovia), Green Swallowtail (Papilio peranthus) and Ambrax Butterfly (Papilio ambrax) just to name a few. However, the actual butterfly aviary was compartmentalised to only a corner of what the original butterfly enclosure was when it was first opened in 1987. This week, I made a visit to the Sentosa Butterfly Park again, to see if there had been any changes to the facilities. Sentosa Island itself had undergone an amazing transformation with the Resorts World starting with its soft opening in 2010 and the official opening of the Integrated Resort in 2012. Today, Resorts World, especially Universal Studios, is a must-visit destination for many families out for a day of fun and excitement in Sentosa. 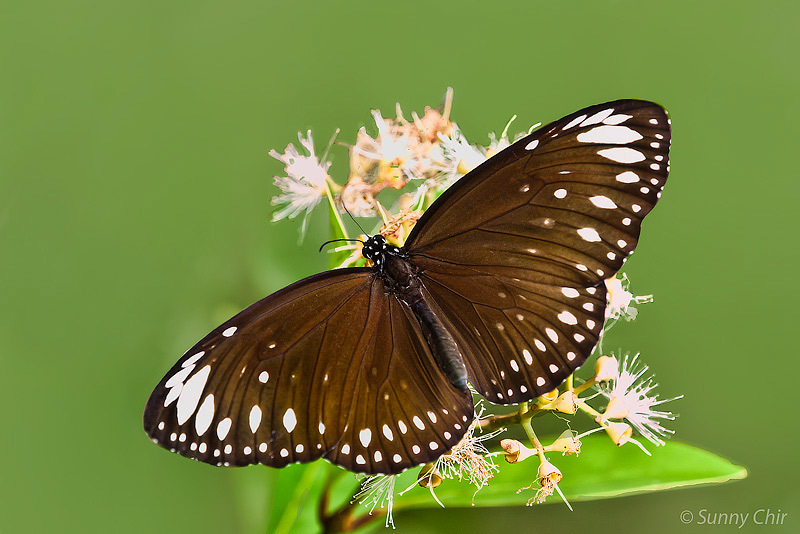 After I paid the S$16 admission fee to the Butterfly Park, I observed that the general condition of the premises had somewhat deteriorated from the last time I visited it four years ago. There were a lot of stacked boxes around the untidy corridors next to the ticketing booth and the Butterfly Park seemed to lack a 'sense of arrival' that many theme parks around the world feature. As I parted the plastic chain curtains that led into the first part of the Butterfly Park, I was rather disappointed to see that the butterfly aviary portion of the facility had remained the same as it was, four years ago. 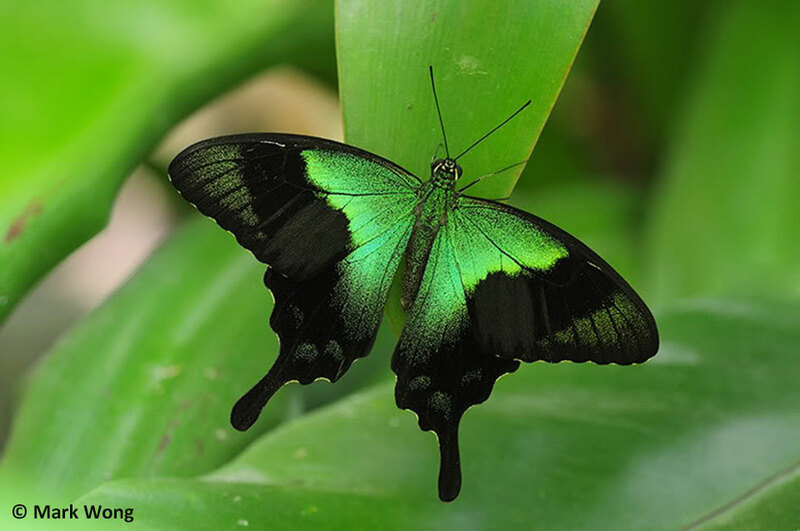 The size of the area that featured live butterflies had been reduced to about a third of the original size of the facility that opened back in 1987. The other compartments featured showbirds and other animals, which seemed to attract the attention of the tourists that were around on that day I visited. 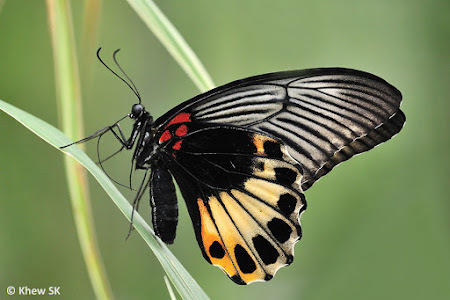 There seemed to be no more than 10-15 species of butterflies flying around, although there were quite a number of pupae in the Pupa House that awaited eclosion. The physical infrastructure appeared to be very much in need of a major facelift, as the structures looked tired and run-down. The name Butterfly Park seems to be a misnomer now, as a much larger part of the enclosure is dedicated to birds, lizards and other critters. 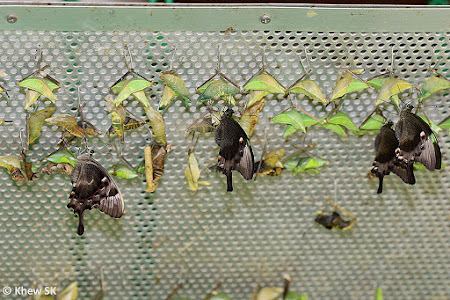 Whilst I acknowledge that the number of flying butterflies within the enclosure can fluctuate from time to time, depending on the availability of pupae from its supply chain, what a visitor can see on a typical day seems to be a far cry from the touted (probably misrepresented in Wikipedia) 15,000 live butterflies! I counted no more than 150 live butterflies fluttering around. Wayfinding was generally easy, although there were some strange dead-end corners here and there that probably made sense in the original enclosure before the partitioning. The Pupa House looked very much the same as it did many years ago, with some minor facelifts. At least there was a staff who was stationed there to brief the visitors (and also to stop them from manhandling the newly eclosed and vulnerable butterflies!). Something unacceptable in the Pupa House. Signages depict copyrighted work of photographers from whom permission was not sought. The photos used also cropped off the authors' copyright, indicating a premeditated intention to remove the copyright notice? Furthermore, the identification of the butterflies on the two photos on the signage is incorrect. Did the curators do proper research on the species before putting up these signages? I was very disappointed to see the rather amateurish educational posters in the Pupa House. A couple of the posters had the species misidentified! What was worse, was at least two of the photos depicted were plagiarised from my photographer friends without their permission! 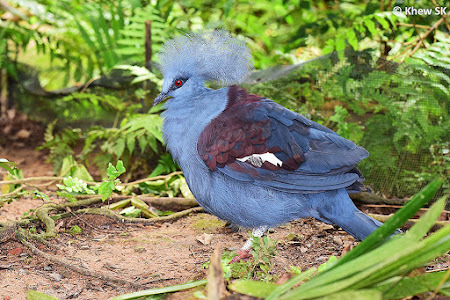 Come on, the people in charge of Sentosa Butterfly Park; as a profit-making commercial entity, surely you would be aware of using others' intellectual property without their consent? I hope that the people concerned would take note and correct this injustice immediately, and perhaps pen a note of apology to the photographers concerned. The focus of the "Butterfly Park" appears to be more towards birds and other more exotic attractions to cater to tourist preferences? I continued on my journey through the enclosure and observed the bird show and a very tame iguana that seemed to be quite happy to let visitors stroke it. There were some tortoises and exotic looking birds along the trail. Tourists and visitors seemed to be more interested and spent more time looking at these animals and birds rather than the butterflies. Perhaps this attraction could be rebranded to Sentosa Butterfly and Bird Park instead? The tunnels leading to the framed collections were very much the same as I remembered them from many years ago. I suppose these museum specimens are still relevant and held some educational value for the visitors. With today's low-priced graphics and printing technology, perhaps some of these static displays could be given a quick facelift and refresh some of the exhibits. Hiring a good graphics designer can make a big difference to the signage. Can you count the number of beetles used in this piece of artwork? I could never bring myself to accept 'works of art' made with the bodies of numerous dead insects. 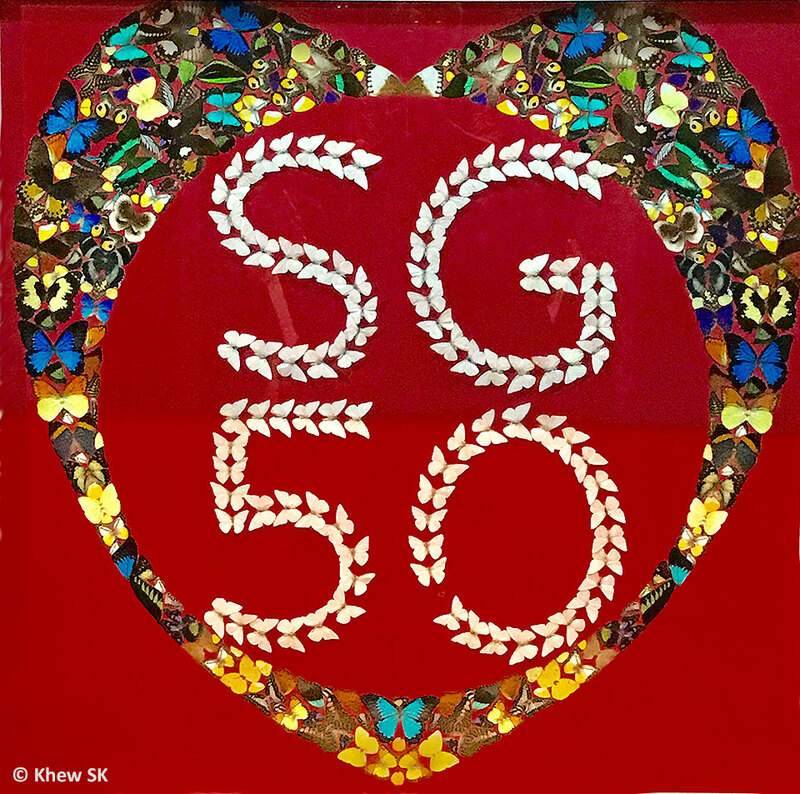 There was another occasion in 2010 where ButterflyCircle members lodged a protest to the Singapore Art Museum for an art piece which featured dead butterflies. Various emails to the persons in charge eventually ended with a response from Prof Tommy Koh (then Chairman of the National Heritage Board) himself, who acknowledged our emails by saying "You have, however, made an important point, and, going forward, I will request all our museums and curators to keep in mind the ethic that we should treat all animals with respect." Unquote. Using large numbers of dead insects as artwork? It is not illegal as such, but you be the judge as to whether it is necessary. And then I see these framed specimens. It is quite heartbreaking to see dead butterflies and beetles depicted in such a manner. 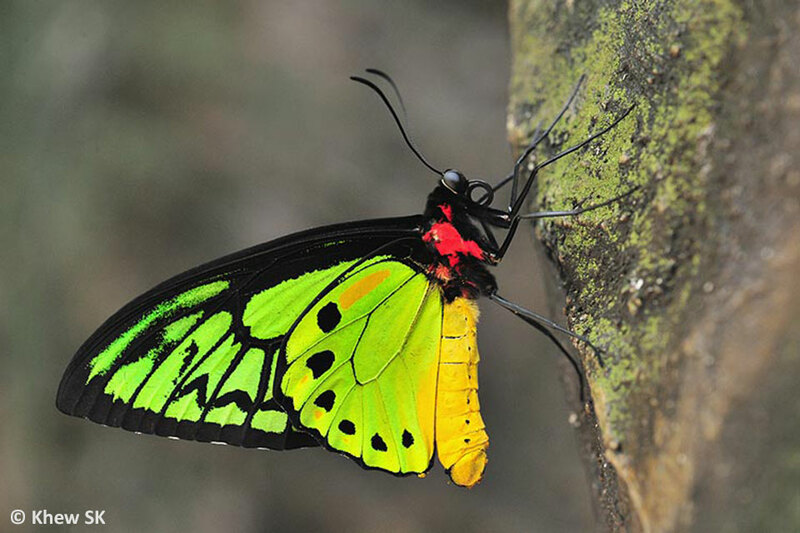 Some observers will see nothing wrong in breeding butterflies and beetles and then killing them to create a collage such as the ones shown here. To each his own. The point made here, is that such pieces of "art" have very little to do with nature education nor conservation. 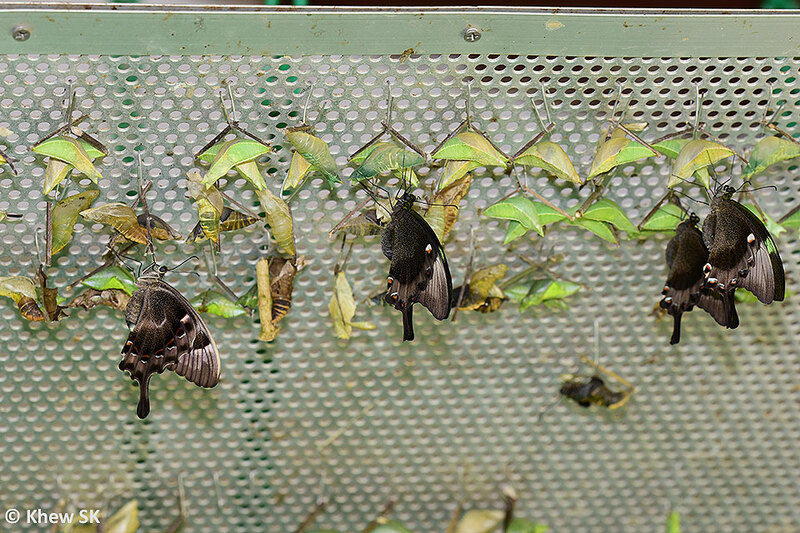 As a paying visitor, I left the Sentosa Butterfly Park, totally disappointed and saddened at what it had become. The original vision seemed to have been long forgotten. It is indeed a pale shadow of its past glory. Perhaps my observations and comments are premature, and the owners of SBP have something up their sleeves with a new facelift planned. 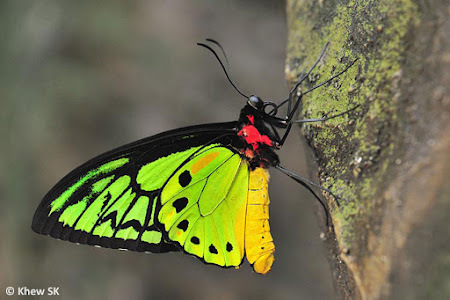 Perhaps they should take a page from Entopia and what Joseph Goh has done for the Penang Butterfly Farm. It is a risky investment, no doubt - but probably a necessary one, if SBP wants to remain competitive. I did a quick check on TripAdvisor and the spontaneous reviews made by visitors and tourists to SBP and Entopia. The results speak for themselves, for what they are worth. It may not be fair to compare a facility that is about 30 years old with one that is just newly-minted. But this is what the competition for the tourist dollar is all about. Can SBP afford to remain stagnant? Its own, and Singapore's eco-tourism's reputation is at stake.